Learning styles teach us that everyone learns differently. Dale's Cone of Experience shows us how to help our students use what is taught in the classroom. For example, people usually remember 10% of what they read but 90% of what they do. After reading you're able to perform basic tasks such as defining, listing, describing, and explaining. However, after doing something you can analyze, design, create, and evaluate.This might be one reason why role plays are so popular in TEFL classes. It's really interesting to see how people learn differently and what people are able to do after learning something. Bloom's Taxonomy and the Learning Pyramid also have to do with this. Education Canada has info about how we can use Dale's Cone in second language classes. Not everyone agrees with this. 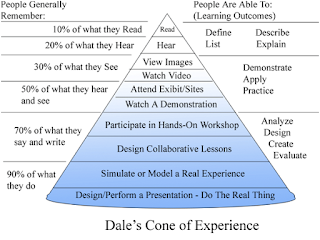 Brain Friendly Trainer wrote about how Dale's Cone has been debunked. The best thing to do is do the research yourself and try different activities with your students.